Nokia is a novice in a bluetooth-headset market but that doesn't prevent it from creating interesting products. And HS-3W headset is one of those solutions. Its target group is a business audience and those who prefer not to wear a headset permanently. Sony Ericsson HBH-20 may be considered a prototype for the model. 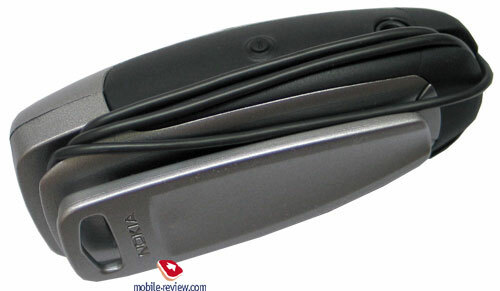 There is the main headset block that is fixed on your clothes with a clip and a usual wire earphone. The main block may be hidden in your clothes and nobody will guess you're using a wireless headset (sounds ambiguous in this context). But the product is not just a copy it brings its own original ideas also. First, in HBH-20 case you needed to answer a call on the phone or on the main block that made you carry it on an overcoat. 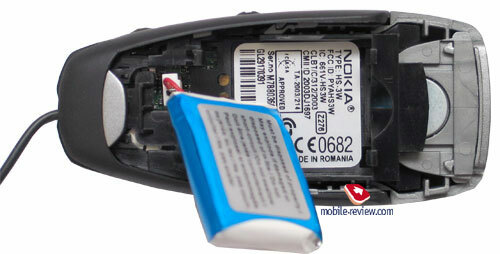 In Nokia case the answer/reject call button is on the earphone and the same button is responsible for voice dialing. The solution is interesting and really making life easier. Thus the main module may be carried under overcoat, for example, in an internal pocket of a jacket or a coat. The second unordinary thing is the disposition of a microphone and the presence of a wire presupposed a standard solution like in usual headsets. But here everything is different and the microphone is on the bottom end of the earphone just near the answer button. That conscious distancing from the mouth doesn't look well-taken but working with the headset we had no problems with voice transmission. You interlocutor hears you well though you'll need to direct the microphone towards your mouth (the earphone is placed well not always and it needs adjusting). The earphone is oblong and that is a sort of a copy of other bluetooth headsets by other manufacturers (also wireless). The headset will serve well in a car with closed windows, silent rooms but in the street with medium noise level the interlocutor hears you badly. The main block is large but its mass plays no role since it's not felt with this way of fixing. The clip fixes the device firmly and it almost doesn't slip down when you run. There are volume level buttons on the block (they are rubberized) and an On/Off button. The back panel with a clip is removable and a Li-Pol battery is hidden behind it. According to the manufacturer it works for up to 5 hours in the talk mode and up to 120 hours in the standby mode. During our tests the headset worked for 3 days in case on 20 minutes of talks a day. The headset supports protocol bluetooth 1.1 and such profiles as headset and handsfree. Up to 8 coupled phones may be kept in the memory (a key for coupling goes with the headset written on a separate piece of paper) and the first registered phone becomes a default device. The headset also understands such words as the last used phone. So, when turned on the headset finds the default phone and connects to it. If that's impossible it connects to the last used one. It doesn't try to connect to other 6 phones and that is possible to do from your phone. At an incoming call the headset signals once and in two seconds a Nokia Tunes melody starts playing in the earphone. You can't choose own melody. The earphone is large and uncomfortable to wear all the time; it's better to use it only during a conversation (plastic without any rubber covers). An external loudspeaker is absent. There is a strap included into a package and thus the headset may be hung on your neck. I won't judge if that's necessary. A headset wire may be rolled around the main block and the earphone may be fixed to it using a magnet. There is a light indicator on the front panel, it lights during the charge and blinks at the call (that's lilac). Sound may be turned off during a call, that's a Mute function. A possibility to transfer the sound to the handset and back should be pointed out. In general the headset doesn't suppose any great functionality but it's rather pleasant in its class. 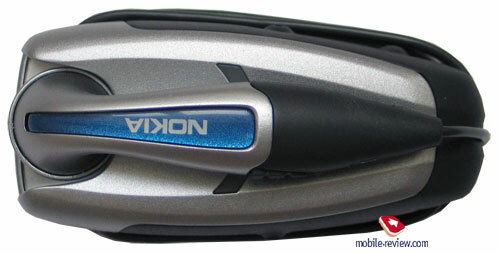 Its rival Sony Ericsson HBH-200 has an external loudspeaker and a display showing a caller's number. The price differs for 20-25 USD and that's for you to decide how much you need the named functions. Nokia's headset with the price of 95-100 USD is interesting and what is the main reliable, you'll have no problems when working with phones by other manufacturers. 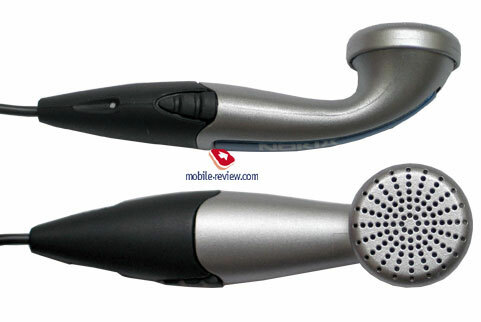 That is a great choice for those who use handsets of various manufacturers and uses a headset in quiet places. The model distinguishes in design, big size of the main block (many users prefer big size since the weight is not felt anyway). In general the headset is good and worth attention. The only disadvantage comes from the construction, the headset may be used in a limited number of places and conditions, placing the microphone on the wire seems more logical. The headset is inferior to the rivals in the main parameter and that is connection.